Those that have led our military at the highest levels are all in agreement. The Liar-in-Chief is not fit to lead a pack of rats, much less the Armed Forces of our great nation. They might not call him a “f…ing moron” like some of his Cabinet members, but they all know his ignorance is as real as his pathological lying. Trump is totally unqualified to be President and he demonstrates it every single day. In the over 665 days in office he has spent over 200 at his resort properties or playing golf. What Cadet Bone Spurs hasn’t done is make even a single visit to our troops in harm’s way. And on Veteran’s Day he could not even be bothered to visit Arlington Cemetery, just 6 miles from the White House. Honoring our military is beyond him. He honors no one other than himself. He consistently believes Russia, China and North Korea over our allies and our own defense and intelligence communities. He is a traitor. He needs to be impeached and investigated to the fullest extent of the law. 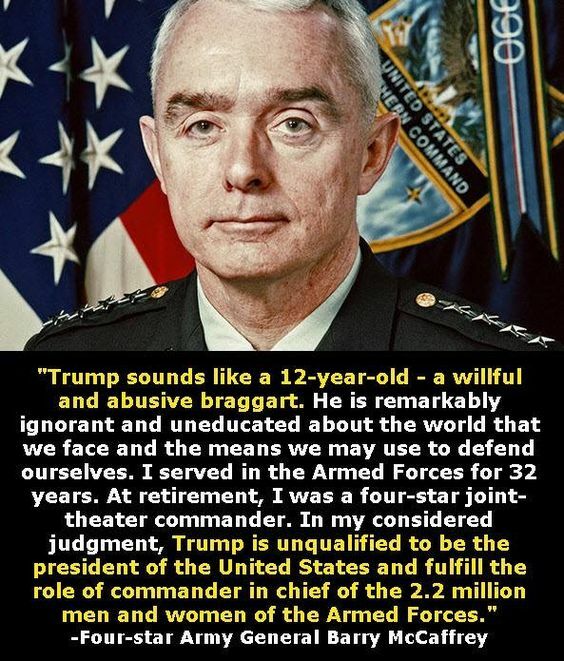 This entry was posted in News & Views, Quotes and tagged 12 tear old, abusive braggart, allies, Arlington Cemetery, armed forces, Cadet Bone Spurs, China, commander-in-chief, General Barry McCaffrey, honor, ignorant, impeachment, military, North Korea, racist, Russia, traitor, Trump, uneducated, Unqualified, Veteran's Day, willful on November 20, 2018 by Ray Buchanan.